Migration to other territories within the vast Indonesian archipelago was also part of a general pattern in the Moluccas. From the letters of the Neumann family, we gain a unique picture of an Ambonese family that became widely scattered. The letters also offer an occasional glimpse of the poorer relatives who sent their children to study in Batavia in the hope that they would gain an acceptable job as office clerks. Family members who emigrated remained in contact with each other, forming a small colony in the city of Batavia and maintaining their links with Ambon. Relations with home were maintained, and presumably this held true for all the Moluccans who left their native islands and ranged out across the Indonesian archipelago. According to the 1930 census, about 16 per cent of Moluccan Christians lived outside their home islands. Traditionally, the highest status an Ambonese Christian could attain would be Burghership, and a position as clerk or teacher. In contrast, a position in the army was generally spurned. This aversion to military service had already been prevalent in the 18th century when village headmen had to furnish young men for the annual patrols guarding the clove monopoly. For those living on the Ambon islands, upward social mobility came through education, missionary work and Burghership, while the army was traditionally considered to be an instrument of economic oppression. The bases for missionary work and education, also in the Dutch language, were already laid in the 17th century. However, these became gradually eroded in the 18th century, a period of economic decline in the Moluccas. Things began to pick up when the Reverend Joseph Kam, shortly after his arrival in 1815, installed a small printing press at the back of his home; here he produced religious matter for his local readership. Then in 1834 the missionary Bernhard Roskott founded a teachers' training college, which by 1855 had turned out 82 teachers. Most of them found jobs in the village schools on the Moluccan islands. Although these pupil-teachers in the main received Bible instruction, the missionary background undoubtedly enhanced the status of the elementary schoolteacher. From 1856 on, children of native Christian Burghers had the opportunity of attending a European elementary school without having to pay fees. As on the island of Ternate, so too on Ambon, in most cases a distinction was no longer made between the descendants of Europeans, and Christian Burghers; admission to elementary school, and hence the opportunity of gaining a job as a low-ranking civil servant, became equally possible for them all. However, this was only in principle; the two elementary schools on Ambon could not possibly accommodate all the children of the 8,000 Ambonese Burghers. There were, furthermore, few job opportunities in the Moluccas for these junior civil servants — unlike the encouraging outlook for schoolteachers. It is doubtful whether the missionary teaching made much impact on Dutch fluency among the Ambonese — the Bible was, after all, translated into Malay. Nevertheless, in the second part of the 19th century the Dutch language spread even to the small villages. The inspector for education. Van der Chijs, reported in about 1860 that the Ambonese were more inclined to regard Dutch as their language than were the Indo-Europeans in Java. The affection for the Dutch language would only grow stronger. After the establishment of the second European school in 1856, the Ambon Burgher School was founded in 1869; this was intended for the native Christians of Ambon and had Dutch on its curriculum. Pupils with the highest marks in their school-leaving exams received the diploma of junior civil servant. It seems that in the 1860s there was enormous enthusiasm among the Ambonese Christians to become teachers. Indeed, they were so keen that it was reported, "If they are not curbed, half the male population would become a schoolmaster". Not surprisingly, when the government teacher training college opened its doors in Ambon in 1874, there were many applicants. Anyone with a certificate as junior civil servant or schoolteacher who failed to find work in the Moluccas left for Java, for the towns of Surabaya, Semarang or Batavia. Some students found their way to the STOVIA ([School Tot Opleiding Voor Indlandsche Artsen =] college for training native medical doctors) in Batavia, which had been founded in 1852. By 1883 the Ambonese contingent in the Dutch-Indies army had doubled to 801 from Manado and 708 from Ambon. The appeal of the army would increase even more on the Ambon islands in the 1890s, when the prices of cloves fell once again. At last there were sufficient volunteers — and the same was true for Minahasa. Indeed, here the army authorities were even able to select out of the large numbers who applied. Ultimately, the greatest number of soldiers would come from Minahasa; in 1918 there were 6,388 soldiers from Minahasa compared with 3,674 from the Moluccan islands. The increasing majority from Manado can easily be explained: in the 1870s the Christian populations of these two areas were more or less the same size, that is, around 60,000. The figures for the 1900 census, however, are 72,359 native Christians on the Ambon islands compared with 164,117 in the Minahasa region. The former military became part of the village notables, along with the raja and other village headmen and the schoolteachers, who were on a slightly lower rung of the social ladder. Both in Minahasa and on the Ambon islands it became part of the local pattern of social mobility to enter military service; it also formed a confirmation of the Christian identity of these communities. The army did not, however, initiate the integration of the Christian communities in the colonial world. The image that has evolved in Dutch colonial history of the Ambonese as a martial race is primarily a colonial picture and does not reflect a predilection for the military life on the part of the Ambonese. Mawdudi doesn't sound all that different from a million other revolutionaries—religious or secular—who have no use for democracy until everyone is properly (re)educated and therefore can be expected to vote the approved way. Fundamentalism and extremism speak to the Muslim world’s deep-seated yearning for change. Sentiments that decades ago supported leftist ideologies across the Muslim world today fuel Islamic ideology and more so the extremist interpretations of it. Look and listen closely and you can see Lenin’s ghost standing behind Khomeini, and an undertone of Che Guevara in bin Laden’s bluster. Bin Laden is not quite as dashing as Che, and al-Qaeda is far too steeped in jihadism to have come up with a really good T-shirt, but still it has attained glory as the iconic flag-bearer of resistance in the postcommunist world. It appeals to those who, after the fall of the Berlin Wall, still yearn for revolution. Until violent jihadism meets the same fate in the many pockets of the region where it is currently wreaking havoc that Islamic revolution met in Algeria, many Muslims will continue to see in the jihadi fighter a compelling representative of their hunger for success and respect. This is why the effort to quash radical groups is vitally important and must be sustained. But fundamentalism has also been changing from within, recognizing the limits of revolutionary violence and turning attention instead to participation in elections and to winning over converts by championing the cause of social justice and representing the interests of the poor in the political system, providing much-needed social services. With the putting down of Islamic revolts in state after state—Egypt after 1981, Syria in 1982, Algeria after 1991, and most recently, Saudi Arabia after 9/11—many fundamentalists conceded that the creation of Islamic states was no longer in the cards. The call for an Islamic state was not entirely abandoned, but increasingly it was recognized as a distant prospect, and social activism took over as the work at hand. Many popular clerics have also stepped up to denounce violence in the name of Islam, especially in the wake of 9/11. Even Shia fundamentalism, which was the force behind Khomeini’s fashioning of the Islamic Republic as the domain of clerics and which sees politics as inseparable from Islam, has been moderating. Three decades after the Iranian Revolution, it is not Khomeini’s heirs who are the most popular voices of Shia faith, but the quietist Ayatollah Sayyid Ali al-Sistani, who sees to the affairs of his community from his perch in the holy city of Najaf in southern Iraq. Sistani stands for the older Shia tradition, which holds that, absent the return of the messiah, the Mahdi, the ideal Islamic order is not within the realm of the possible. Clerics, he says, should merely see to it that the state does not repress Islam or violate major Islamic teachings, and should otherwise leave politics alone. Since 2003, Sistani has gathered an impressive following and is today the most venerated and influential Shia cleric not only in Iraq, but far beyond. Shias from Detroit to Delhi embrace him as their “source of emulation.” Even in Lebanon, where Shiism is usually associated with Hezbollah, most Shias follow Sistani. That is also now the case in Kuwait and Saudi Arabia. Even in Iran, observant Shias have turned to Sistani. The chasm between the Shah and his people had become glaringly obvious. What was less clear, but equally important, was a chasm between the communist and socialist visions for the country of the secular intellectual elite and the middle-class professionals and the hopes of the ardent lower-class followers of Khomeini. At least the chasm was misunderstood by the secularists. Among the secular agitators against the monarchy, clerics and their followers were widely regarded as harmless hangers-on to the great bandwagon of revolution. The secularists failed to perceive both Khomeini’s true intentions, and the surging momentum—and force in numbers—of the backing for him among the teeming urban and rural lower and working classes. The exploding numbers of urban factory workers had no infatuation with the ideologies that fascinated the middle class; Khomeini’s populist call for freeing Iran of dictatorship and spreading the oil wealth among the population is what appealed to them. It was as if years of thinking secular thoughts and following secular ideologies had blinded these secular activists to reality. They correctly perceived that their support for Khomeini was vital in building widespread support for a revolution. Leftist jargon did not percolate down into society very well, and the revolution needed the support of larger numbers—of the poor and traditional Iranians who looked to the clergy for moral and political leadership. But the secularists failed to appreciate the intensity of Khomeni’s mission to establish an Islamic state, or to think through what would be in store for them if and when the clergy took power. With the revolution triumphant throngs of class warriors banded together in revolutionary committees and militias, and backing Khomeini’s cause, came out of slums and working-class neighborhoods, bazaars, and poorer quarters of the city to claim their prize. They were quick learners. None knew what dialectics of history was about or what Marx had penned in his Das Kapital. Khomeini had taught them it was not necessary to convert to Marxism to be a revolutionary; it was more important to make the revolution Islamic. The middle-class pro-communist and pro-democracy protestors were shocked by the numbers of Khomeini’s forces and their zeal, and they quickly came to understand they were outgunned. The clergy drew large crowds to demonstrations day after day, and even larger numbers to voting booths for a national referendum and constituent assembly elections that were to decide the fate of the revolution. The middle class cringed at the takeover unfolding, and efforts were made to better organize and resist. But leftist and pro-democracy rallies were disrupted by club-wielding thugs, who also stormed Tehran University to purge it of leftists. When in March tens of thousands of middle-class women poured into the streets to demand freedom of dress, vigilante thugs attacked them. Pro-democracy forces formed a new party, the National Democratic Front, and at first large crowds showed up at its rallies. But after only a few confrontations with Khomeini’s stone-throwing and club-wielding mobs, the Front melted away. Looking back over the decades since Ataturk and Reza Shah ruled we can see that much in way of economic development and social change has been achieved in the Middle East. Kemalist presidents, kings, and generals unified countries, and built roads, modern school systems, and hospitals. But those authoritarian regimes also often lost their way, succumbing to the temptation of despotism, and in the process growing corrupt. The leviathans they created also stifled market forces and hindered true economic change. Top-down modernization had its limits. States can do things faster and more efficiently than markets, but only to get things moving; they are notoriously bad at managing economies once they are out of the gate. Kemalist states did not know when and how to stop growing, and that was their undoing. Unchecked by parliaments and unaccountable to the people, the Kemalist states have lived up to the saying: “Power tends to corrupt, and absolute power corrupts absolutely.” Kemalism never had a problem garnering support in the West. Defenders of Kemalism, such as the historian Bernard Lewis, had hoped that by promoting secularism and modernity the state would serve as handmaiden of democracy, believing that modernity must come before democracy, especially given Islam’s strong hold on the structures of power, and the hearts and minds of the populace. Democracy would have to follow dictatorship. But by the 1970s, Kemalism was running aground everywhere. The state remained imposing, but its modernizing edge was gone. The juggernaut of swift reform, secularism, and rapid change had ground to a halt. Accolades for the state and trust in its ability to transform society and economy had given place to widespread cynicism and doubt among the populace. In the Arab world modernizing states became platforms for the dynastic machinations of strongman presidents; their best-functioning institutions—impressive in their efficiency—became their dreaded mukhabarat, intelligence and security services. One of Kemalism’s legacies is pent-up rage among the lower classes, to whom so few of the economic benefits flowed, and who greatly resented the assault on Islam. This pent-up rage has in time inflicted much travail on the region—as well as on the West. It was the driving force that tipped the balance of power toward fundamentalism in the Iranian Revolution, and it has been the fuel driving the support around the region for Islamic extremism. Crucial to Kemalism’s failure to generate more robust economic growth, and to distribute economic benefits more equitably, was the manner in which it bred a highly dependent, rather than entrepreneurial, middle class. Catenary – In a coffee-table book I purchased recently at a collector's fair, I discovered a new term for what I've always just called the overhead wires that power streetcars or trolley buses. The book, Streetcar Days in Honolulu, instead employs the technical term catenary, no doubt following prevailing usage in the records of the Honolulu Rapid Transit & Land Company. It's a fascinating book for anyone who has spent as much time riding Honolulu's TheBus system and researching local history as I have. Ka‘auila – In the same book, I also discovered the Hawaiian word for ‘streetcar’, ka‘auila, which turned up in the name of the company newsletter, Ohua Ka‘auila. ‘Ōhua means ‘retainers, dependents, servants, inmates, members (of a family), visitors or sojourners in a household; passengers, as on a ship’ and the neologism ka‘auila bears only a coincidental resemblance to what one might imagine car and wheel to look like when borrowed into Hawaiian. The noun ka‘a ‘wheeled vehicle (carriage, wagon, automobile, car, cart, coach, buggy)’ derives instead from the ka‘a that means ‘to roll, turn, twist, wallow, wind, braid, revolve’ or ‘rolling, twisting, turning, sloping’ (< Proto-Polynesian *taka). I first encountered this word in the Hawaiian placename Pu‘u ‘Ualaka‘a (‘hill + sweet potato + rolling’, with Hawaiian ‘uala ~ Māori kūmara) for the hillside nowadays more commonly called Round Top. The earlier meaning of uila was ‘lightning’ (< PPN *‘uhila, with PPN *‘ and *h both lost in Hawaiian), which was later extended to mean ‘electricity; electric’. So ka‘auila is literally ‘vehicle-electric’. 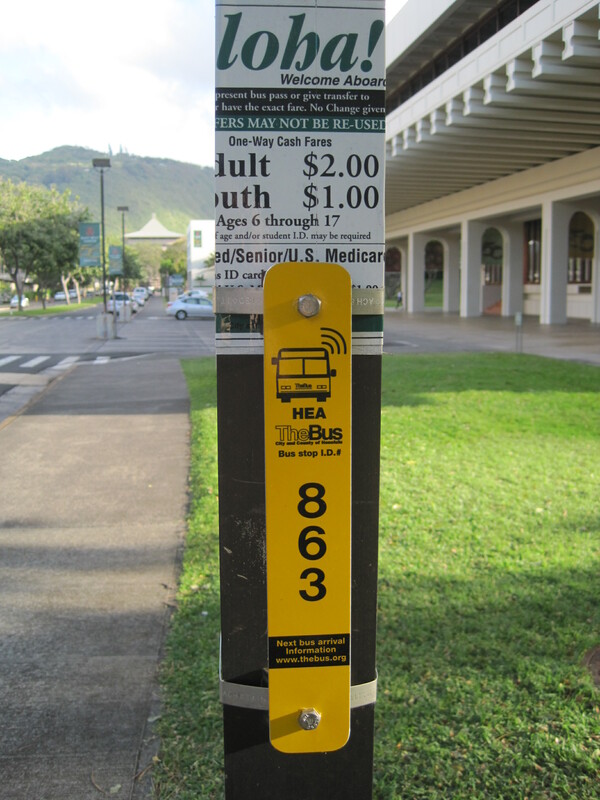 HEA – Honolulu Estimated Arrival is a new service of TheBus that allows passengers to track bus arrivals at any particular stop electronically via Google Maps. The acronym (or initialism) was crafted to match the Hawaiian question word hea (< PPN *fea), which translates as ‘which’ when it follows a noun, or ‘where’ when it follows a locative preposition. So the catch phrase to promote the new service is the Hawaiian question Aia i HEA ke ka‘a ‘ohua? (‘there at where the vehicle passenger’) ‘Where is the bus?’ The answers, the HEA times, can be found at http://hea.thebus.org/. Not bad, eh, for a municipal transit authority? Two books about Indonesia that I've recently blogged excerpts from have discussed divisions between newcomers and local-born, assimilated expatriates in the former Dutch Indies. In Bittersweet: The Memoir of a Chinese Indonesian Family in the Twentieth Century, local-born Chinese are referred to by the Malay/Indonesian word peranakan (< anak 'child'), whose other meanings include 'of mixed ethnicity or cultural orientation' (therefore 'creole'), 'hybrid (of cattle)', or 'uterus, womb'. By contrast, the newly arrived (F.O.B., Issei, etc.) immigrants are called totok, meaning 'pure, full-blooded' in Malay/Indonesian. The Malay/Indonesian word totok is also used in Being "Dutch" in the Indies: A History of Creolisation and Empire, 1500–1920 to refer to Dutch expatriates newly arrived from the Netherlands. But the contrasting formal term used to designate the local-born Dutch expatriates is "Indo-European" (rather than the perhaps too informal Indo) in the English translation, apparently following later endonymic usage by the same group during the era of rising nationalism during the 1800s. The inclusion of the Mestizos and the poor whites in the category "European" was a legal and, to some extent, a cultural question; but despite this incorporation, a vast social gulf remained between rich and poor. Newcomers expressed their discomfort (caused by the lower-class Europeans) by mocking those born in the Indies, particularly Indo-Europeans. Interestingly, just as it had been a century earlier, it was not the Mestizo men but the women who came in for criticism. Johannes Olivier, who travelled in the East between 1817 and 1826, referred — like his 17th- and 18th-century predecessors — to the "loose manners of the female Liplaps [half-breeds]". At the same time he admitted that "there are some exceptions, and indeed certain of the Creole girls are truly beautiful, with souls as pure as their skin is white". Skin colour would frequently be related to inner purity. This same Olivier, who was expelled from the colony in 1826 on account of drunken and unseemly behaviour, returned to the Netherlands and became head of a boarding school in Kampen. He saw fit to air his prejudiced views in his own periodical De Oosterling, the oldest journal about the East Indies to be published in the Netherlands. In it he made fun of the garbled Dutch spoken by the "coloureds". Olivier was, of course, a colonial snob, horrified (at least, on paper) by racial mixing and contact between European men and Indo-European or Indonesian women. But he was one of many. Feelings arising out of racial prejudice would often be expressed in moral terms, cloaked in arguments of public decency and educational standards. Thus, in 1835 the commander-in-chief of the Dutch Indies' army Hubert J.J.L. Riddel de Stuers wrote of Indo-Europeans: "They possess the bad characteristics of the European, combined with those of the Indonesians. They take after their fathers in their excessively lascivious ways, and by their mothers they are brought up in idleness. How could they possibly turn out good?" What De Stuers was describing here was the notion of the hybrid, a concept that took firm root in the later 19th century. It had its origins in biology, where it was used co refer to the crossing of two breeds of animal, implying the combining of two pure strains. As used here, it seems to mean the combination of two "pure" racial types. It is striking that the hybrid apparently combines most remarkably all the bad qualities of the two parent races from which it is composed." Although the term "hybrid" never became part of everyday speech, it was certainly widely used in the Indies and contributed to the racial stereotyping associated with the European underclass. Many expressions came into everyday use ro refer to the poor (Indo-)Europeans, for instance, Liplap, blauwtje (blue-hued), sinjo (for men), nonna (for girls), petjoek (a cormorant), Indo and the accepted "correct" term inlandse kinderen, which means literally, "native children". Besides the ever-present prejudices, there also developed a social vision in which the various offshoots of the European clan were deliberately drawn closer to the European community. In this process, the long history of the Dutch presence in the East Indies and the fact that most government jobs were filled by Indies-born Europeans were both highly significant. Indeed, the Indische element in colonial society was so overwhelming that it would have been impossible to exclude on explicit grounds the Europeans born in the Indies. When he became president, Ahmadinejad followed through with sound and fury in clamping down on the private sector. He shoved aside the normal economic-policy agencies and put monetary, budget, and fiscal matters under the president’s office. He then used that control to print money with no regard for the inflationary consequences. Iran’s money supply soon ballooned by a staggering 40 percent. His office also used its discretionary authority over planning and budgets to hand out contracts large and small to allies and favorites. A series of central bank governors resigned in protest—the last to go accused the president of mismanagement and plundering bank reserves. To combat the growing problems Ahmadinejad proposed price controls as well as tightening the regulation of banking and credit markets. He even mused aloud about the benefits of abolishing interest (which despite all the talk of Islam’s ban on usury has remained the foundation of banking in the Islamic Republic), in the end settling for rates a good 10 and 15 points below the rate of inflation. Those who could withdrew their savings and bought real estate at home or abroad; those who could not saw their money dwindle amid Ahmadinejad’s flood of devalued currency. Salaried workers and pensioners suffered most. Ahmadinejad cared little if he was scaring businessmen into sending billions out of the country. At one point, he said that Iran’s economic problems would go away if a few people from the stock market could be stood up in front of a firing squad. The economic sanctions that his wild rhetoric helped to attract seemed to concern him even less. Capital investment, especially in manufacturing, dried up. Production fell, and by 2008 many factories were working at less than half their capacity. The money that was flowing into land speculation and property development was causing higher real-estate prices and construction costs—the latter dealing an especially heavy blow to a country that desperately needs to build up its basic infrastructure. Ahmadinejad flaunted his lack of concern with economic planning and numbers; to him inflation and unemployment were alien concepts. He once told a reporter that he got his economic news from his neighborhood butcher (when that butcher too complained about inflation to a newspaper, Ahmadinejad closed the paper). Ahmadinejad’s game was raw populism. Why not bribe the poor for their support when there are so many more of them than there are of those wealthy Iranians who live in prosperous enclaves and depend on the private sector? He almost tripled government spending from $15 billion to $40 billion. Everywhere he traveled he promised public projects, and then decided to do more, to take wads of cash and checks to rallies and distribute them among well-wishers. Pensioners may have had a hard time making ends meet, businessmen may have faced a credit crunch, but all the poor needed to do to get a home loan was to write to the president’s office. The steady rise in oil prices between 2005 and the third quarter of 2008 made this populist spending spree affordable. With dollars from oil sales flooding in, Ahmadinejad could afford to focus on currying favor with the voting masses while putting off hard economic decisions, and the Supreme Leader could afford to stand by and watch as Iran’s president shredded his country’s economy. Ahmadinejad used government contracts funded by the oil windfall to bolster his favorite businessmen and grease the Revolutionary Guards, whose support was essential to his political survival. The private sector changed shape, breaking down into the president’s preferred insiders (who got the contracts, cheap loans, and government support), and everyone else. The high oil prices made it seem, to the undiscerning at least, as if Iran could afford a political strategy masquerading as an economic policy. When oil prices were peaking in 2007–08, Iran brought in $250 billion in petroleum income. Yet by the time prices fell off the table as a credit crunch cooled the global economy drastically in the second half of 2008, there was no more than $25 billion (some estimates run as low as $9 billion) of this left in the country’s cash reserves. Where did all that money go? Not to growth-promoting investments, but to populist causes near and dear to Ahmadinejad. As 2008 came to a close, Iranians found themselves staring into an economic abyss. The official rate of inflation was 27 percent (the real rate is almost certainly higher). Unemployment ran far into double digits too, possibly as high as 35 percent (the government admits to 20 percent). Merchants and salaried workers complained, and labor unions took to protesting for higher wages. The poor began complaining that their government handouts were not going far enough, and wanted more. The exceptionally cold winter of 2007–08 and a drought the following summer had caused first a fuel shortage and then an electricity deficit (Iran relies on rivers and dams for a good portion of its electric power). The depth of unhappiness manifested itself in September 2008, when merchants shut down bazaars across Iran for three days to protest a new sales tax. Growing government spending under Ahmadinejad had made the country dependent on oil prices in the $90 range (Iran claims its budget assumes $37) to stay in the black, and no one could say when prices that high would return. Such a reversal in economic fortunes can be a powerful impetus for regime change. When a period of boom in Southeast Asia ended in the Asian financial crisis of 1997, many governments came under pressure. Anwar Ibrahim led a serious but unsuccessful challenge against Prime Minister Mahathir in Malaysis, and in next-door Indonesia, the Suharto dictatorship unraveled. The global crisis of 2008 and the massive drop in oil prices that it brought have buffeted Iran—which relies on oil for 80 percent of it government revenues—and could well have far-reaching political consequences beyond the summer of 2009 protests. The last time Iran went through a boom-to-bust ride on the oil rollercoaster, there was a revolution. That will not likely happen again, but the downturn could end the current detour down the blind alley of populism and spark renewed interest in economic reform, privatization, and a viable private sector. Government spending (including subsidies that equal 25 percent of annual GDP) are a drag on the economy. Falling oil revenues and mounting government expenditure leave little room for complacency. The government will have to tighten its belt, shrink in size, and look to the private sector to create jobs, generate tax revenue, and grow the economy; and that will require private sector–friendly policies.